Neptune wheel and vehicle wash equipment is designed with the highest degree of flexibility that allows them to conform to a wide range of site specific requirements. The MAXIMUS Series truck washing system is the ideal solution for landfills, quarries and construction sites, as well as for other industrial applications. The systems are suitable for use on all commercial vehicles and trailers that are permitted on public roads. 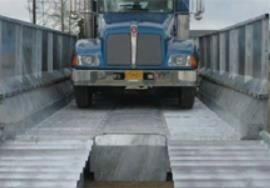 Standard systems have an overall interior width of 114" and each tire wash platform track is a full 42" wide. 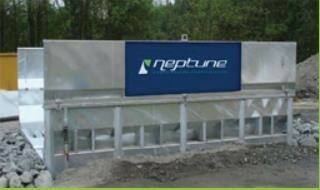 Neptune Wheel Wash Systems offer permanent and temporary/portable solutions. The MAXIMUS Series prefabricated systems can be utilized for long-term or permanent installations. The system has concrete approaches and exits and can be coupled with either a three compartment concrete water recycling and solid separation tank or a prefabricated steel tank. The prefabricated steel wash platform, prefabricated tank, pumps and control panels offer the ability to relocate the system, if needed. 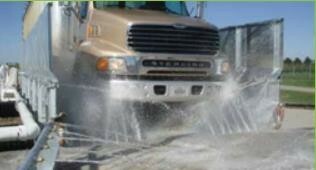 The HERCULES Series delivers the most durable wheel wash system on the market and is ideal for permanent applications. Assembled on site, this system consists of a concrete substructure and center sections for the wash platform and concrete stem walls, coupled with galvanized steel side walls. Typically, the HERCULES Series is installed with a three compartment concrete water recycling and solid separation tank. The tank is designed with one sloped compartment to allow solids to be removed with a front end loader. This system allows the water recycling tank to be used above ground; however, the wash elements are placed inground and over-sized rock or rumble plates are used to transition from the grade of the road. This system requires the use of water recovery chambers (3) and can be used with a standard tank or with a tank equipped with a scraper conveyor (2A or 2B). The system is configured using all four of the component pieces and requires no elevation. The system is designed to be operated on any flat surface. 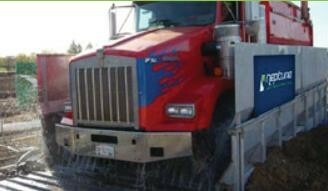 The ramps add additional cleaning effect; serving to help shake off solids prior to trucks entering the wash platform and shaking off excess water upon exiting. The wash platform is 114" wide x 21" deep. The water collection chambers and an additional water pump can be added to the above ground water recycling tank. The wash platform and water collection chamber are set inground and gravel or rumble strips can be added for road access. The large water recycling tank (24' to 32' l x 7' w x 8' h) is set on the ground adjacent to the system.